Summer is over? Already?? How did that happen? I know I shouldn’t be surprised as this has been the case every year since forever, but summer really did seem to fly by. If you’re still in the mood for some summery reading (say… if you’re at the beach this weekend and looking for a quick recommendation), I’d like to suggest This One Summer, a poignant graphic novel by cousins Mariko and Jillian Tamaki. Rose and her parents head to the lake every summer – it’s tradition. It’s where Rose sees Windy, her friend and surrogate little sister, every year. This year’s visit is different, though. Rose is in that in-between stage between kid and teenager, and the atmosphere at the lake is fraught with tension. Her parents might be fighting. Her friendship with Windy doesn’t hold as much appeal. The locals have their own drama. And while secrets are being traded and/or coming to light, Rose and Windy are growing up. This One Summer is an award-winner, and for good reason. It’s a beautifully-written and -illustrated coming of age tale. Rose and Windy are entirely believable characters and friends. Rose is on the cusp of womanhood, with all of the angst and feeling that entails. One of the book’s strengths is the way it outlines how familiar places and social landscapes can change shape faster than you can imagine. The book also shines in its portrayal of family conflict – resolved or not. Another strong point is unpacking the words society uses for girls and women. This book does so many important things well, it’s really impressive. This One Summer was the most banned book of 2016. And that is because the Tamakis not only told a beautiful story, but a true one. There’s so much honesty in the text and the art – and in telling a story around the sorts of secrets that are real and terrible. This One Summer is a slice of summer life as it really is, not sugarcoated, but perhaps heading in a positive direction. I would not hesitate to give this book to any child aged 11-and-up – it will spark important conversations and questions. I mentioned the art, so let’s talk about that. It’s great! The facial expressions in particular are fantastic – rendered in blue and purple colored pencil line work on white pages. There’s visceral feeling imbued in each of the panels, and the choice of subject is subtle and tender at some of the most anxious moments. This book shines in a lot of ways, but the harmony between text and art is really fabulous. 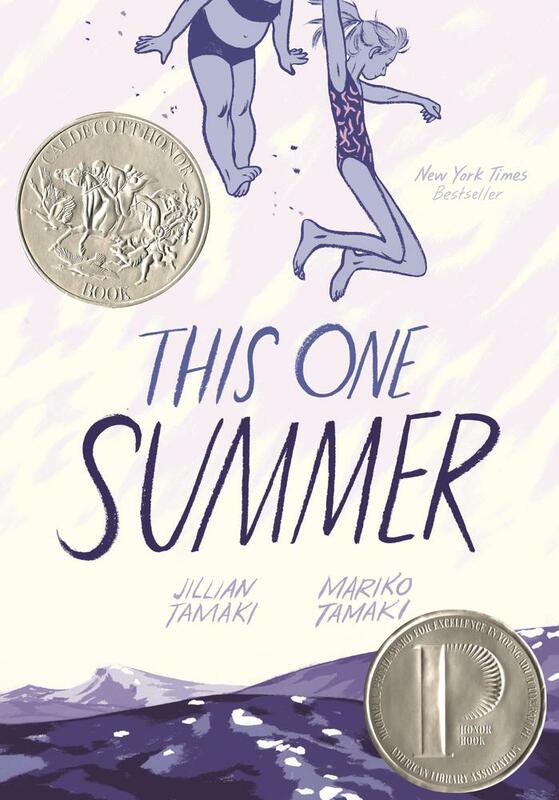 In all, This One Summer is an incredible book, and one that should rightfully become a classic. If you haven’t picked it up yet, do yourself a favor and relive the summer-ness of it (and maybe cry a bit too). Recommended for: fans of excellent graphic novels and anyone who enjoys affecting coming-of-age fiction, á la Melissa Walker’s Unbreak My Heart. Isn't this wonderful? It gave me many emotions and made a lifelong Mariko Tamaki fan of me, even though I've read a few other things by her I haven't loved as much. BUT, I have a trade paperback of her new comic Supergirl and I am extremely looking forward to it.